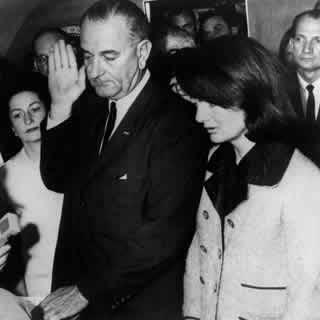 Lyndon B. Johnson shown with Jackie Kennedy taking the oath of office after President John F. Kennedy had been assassinated earlier that day in Dallas, Texas. The long list of enemies assassinated President John F. Kennedy had at the time of his death showed he had made a host of enemies, while in office in two years and ten months of being president. The following list may leave out someone unintentionally, because it is not easy to remember all of his enemies. Some people may not regard some of these people or organizations as JFK’s enemies, but to me they had reasons to have him assassinated. President Lyndon B. Johnson – When Lyndon B. Johnson was defeated in the 1942 race for the U.S. Senate, he was losing in the vote count. However, 202 votes mysteriously turned up in alphabetical order with all the votes being for Johnson. The election judge admitted 35 years later in 1977 that the 202 votes were fraudulent. The voters whose names were on the fraudulent ballots were all deceased. The reason I even mentioned the 1942 Senate race is that LBJ was not that happy being a second banana to the Kennedys, when he accepted the nomination to run for Vice President in 1960. The 1942 race also shows that LBJ would do whatever it takes to win an election. I am not saying that LBJ orchestrated the assassination of JFK, but he had the clout to make it happen if he wanted. One obvious fact is that nobody profited more from the assassination of JFK than LBJ. He went from being a pawn in the Kennedy administration with little or no power, to becoming the most powerful man in the United States. This is tantamount to printing in the New York Times that the Allied Forces are preparing for an invasion at Normandy, France. This must be the fault of the CIA to have leaked this sensitive information so Cuba would be aware of the impending attack. It must be noted that President Dwight D. Eisenhower was still in office when the plan to invade Cuba was instituted. Despite JFK”s eagerness to blame the CIA for the crushing defeat of the invasion force, the president is ultimately the one that must accept the blame. By his failed invasion, JFK infuriated Fidel Castro and the Cuban Freedom Fighters who abandoned them as they fell into the clutches of Castro’s henchmen and many of them were executed. Fidel Castro – It was a huge coincidence that on the same day JFK was assassinated, Rolando Cubela Secades an employee of Fidel Castro was handed a poisoned pen by CIA agents in Paris, for Secades to use to kill Castro. Castro had to know of the assassination plots against them, so naturally he would assume that JFK was behind the plots. It was clear that Castro had caused JFK to go through the October missile crisis of 1962. The Russians finally blinked, but it was Castro who allowed them to set up their missiles, just 90 miles from our shore. His ex-lover Marita Lorenz smuggled a cold cream container with poison pills inside. However, Castro discovered the plot and gave her a gun to shoot Castro, but she couldn’t pull the trigger. Those were just some of the assassination attempts against Castro. If there was anyone that had reason to assassinate JFK, it would be Castro. American Mafia – There were many angry mobsters not happy with the way Robert F. Kennedy was prosecuting Mafia chieftains. The two names I have heard mentioned the most were Sam Giancana and Carlos Marcello as the masterminds behind the JFK assassination. Judith Exner was reportedly the mistress of President Kennedy and the girlfriend of mobster Sam Giancana. Judith Exner was introduced to President Kennedy by Frank Sinatra. Exner’s activities were being watched closely by FBI director J. Edgar Hoover, who was using his knowledge of the affair to potentially blackmail the president to protect his job security. That explains why he was FBI director for so long, since he had blackmail material on every president he served. Louisiana mobster Carlos Marcello had a huge motive for assassinating JFK, since JFK’s brother Robert the attorney general, had Marcello deported to Guatemala. The above statement shows that Marcello wanted JFK dead so his death would deter his brother from pursuing his vendetta against organized crime figures in the United States. The assassination played out just like Marcello mentioned in that a patsy named Lee Harvey Oswald took the fall, while the ones planning the job celebrated.It is just too much of a coincidence for me that Oswald was killed by Ruby who had close connection with the Chicago mobsters. It is ludicrous that the FBI would state that Marcello was not a significant organized crime figure. Even more preposterous is that they said he made his living as a tomato salesman and real estate investor. Then to cap it off the Warren Commission said that Jack Ruby and Marcello had no direct link. FBI – The FBI may not have fired the shots that killed JFK, but J. Edgar Hoover had information about a plot to assassinate JFK just 13 days before the assassination, but apparently did nothing to act on that information. Retired FBI agent said that Joseph Adams Milteer had told William Somersett, a FBI informant on tape that the best way to kill JFK was to shoot him from an office building with a high-powered rifle. It is not surprising to me that Milteer is not even mentioned in the Warren Commission Report. The FBI agent asks if there were plans to assassinate JFK and Milteer replied that they were in the works. Milteer was shown in the crowd at Dealey Plaza, the day of the assassination. Why would he be there to see JFK since he hated JFK? It tells me that he wanted to see for himself that JFK had been assassinated. Adams also says he has information from FBI reports verifying that Lee Harvey Oswald, not only didn’t fire any shots from the Texas Schoolbook Depository Building, but was seen in the break-room at the exact time of the shooting. Knowing that the FBI director Hoover, who was no fan of the Kennedys, had this information and sat on it tells me he was not intent on stopping the assassination. Why didn’t Hoover pass on this information to the Secret Service so they would be extra cautious on November 22, perhaps going so far as to leave the roof closed on the presidential limousine? Hoover almost certainly knew about JFK”s connection with Judith Exner and Marilyn Monroe, but with Kennedy dead he didn’t have to use that information, since his job was safe. CIA – The CIA had motive to assassinate JFK or let someone else assassinate him unimpeded, because only two years earlier JFK had vilified the CIA after the Bay of Pigs fiasco. The president had said the air strikes were not vital, which doomed the invasion. However, he was intent on blaming the CIA, saying he wished he could shatter the CIA into a thousand pieces. Several high level CIA officials handed in their resignations, including CIA director Allen Dulles. So now the CIA has the motive to assassinate JFK, because he showed he was mad enough at the CIA to possibly even dismantle the most secretive intelligence organization. If the CIA was involved in trying to assassinate Fidel Castro, it would not be surprising, that they would entertain thoughts of assassinating the president who had dissed them publicly. Secret Service – There are some that think that the Secret Service was involved in the assassination and Roy Kellerman in particular. Kellerman reportedly turned around to the front after looking back and seeing JFK had been shot, rather than responding immediately. Conspiracy theorists also say Kellerman took JFK”s body from Parkland Hospital by force. William A. Greer the Secret Service agent driving the limousine, slowed down and then brought the limousine to a stop. It is thought that the stopping enabled the killer or killers time to make the fatal head shots. It is difficult to believe that the men hired to protect the president would play a part in his assassination. I can’t see why any of the Secret Service agents would have motive to assassinate the president. It is because of this fact, that I rule out any involvement of the Secret Service in the assassination. KGB – Any list of possible conspirators would have to include the KGB, since Russia had been more or less forced to withdraw their missiles from Cuba only 13 months before the assassination. This had to be the main motivating factor for them to be a participant in his assassination. There was no doubt that Khrushchev was angered at JFK for placing him in the position, where he had to withdraw Russians missiles from Cuba as can be seen in the following portion from scientciapress.com. “According to Dej’s account, when Khrushchev finished reading that cable [from the KGB in Washington saying that Kennedy had ordered a naval quarantine of Cuba], his face was purple. He looked inquiringly at [KGB chief] Semichastny, and, when the terrified general nodded, Khrushchev ‘cursed like a bargeman’. Then he threw Semichastny’s cable on the floor and ground his heel into it. ‘That’s how I’m going to crush that viper,’ he cried. The ‘viper,’ Dej explained in telling the story, was Kennedy. Lee Harvey Oswald reportedly gave the Soviets the intelligence they needed to down the U-2 plane of Gary Powers in 1960. Powers himself said Oswald could have been the one that gave the Russians intelligence they needed to down his plane. The KGB more than likely knew that Oswald intended to assassinate JFK, but did nothing to inform Washington of the impending assassination, since it removed JFK from the scene after JFK had shamed Premier Khrushchev the year before during the Cuban missile crisis. Summary: This November 22 will be the 48th anniversary of the assassination of President John F. Kennedy. It will be six more years till the last files pertaining to the JFK assassination will be released. It is amazing that President Kennedy could have incurred the wrath, of so many enemies in less than three years after being elected. The Warren Commission took the easy way out and concluded that Lee Harvey Oswald acted alone on November 22, 1963, to kill the president of the United States. Oswald’s own statements after being arrested, if they are considered to be truthful, imply that he was only a patsy, which inferred that there was at least one other person involved if not an entity like the CIA or FBI. Evidently, the Warren Commission did not think Oswald was being truthful, because they ruled out any conspiracy theory. If Oswald was a patsy, he was perfect for the job. He had moved to Russia after being discharged from the Marines, which could have gave him access to the KGB. Even though the KGB was suspicious of Oswald, they knew he could be used to further their plans of assassinating President John F. Kennedy. 48 years have passed since President John F. Kennedy was assassinated, but there are many who are not willing to accept the Warren Report conclusion that Oswald acted alone. The fact that Allen Dulles, the former CIA director was on the Warren Commission, skewers the report beyond recognition considering he was there to steer the commission from probing too much into CIA documents related to the assassination. Even President Lyndon B. Johnson said in this statement, probably without thinking that he was saying the Warren Commission Report was not completely truthful about Oswald acting alone. – from How CIA Plot to Kill Castro Backfired, 2 Aug 1976, by Harry Altshuler, quoting Howard K. Smith interview of LBJ. That statement tells me that he thought Oswald did not act alone, if he was blaming Castro for JFK’s assassination, since Fidel Castro wasn’t in the Texas School Book Depository Building the day of the assassination. LBJ is insinuating that Castro was involved and by doing that he is saying that some of Castro’s people may have planned the assassination of JFK with the Cuban government making sure Oswald had what he needed to assassinate President Kennedy. – Whitewash IV, by Harold Weisberg, p. 21. – The Zapruder Film, by David Wrone, p. 247. Cooper was commenting on a draft of the Warren Report. Wrone is citing the papers of J. Lee Rankin, wherein Cooper’s written comments appeared. This page also from History-matters.com shows how the government and non-government witnesses differed on how many heard shots from the grassy knoll with non-government witnesses outnumbering government witnesses 143-73. However the non-government witnesses who thought there was gunfire from the grassy knoll was 44, while the government witnesses only 8 thought the gunfire came from the grassy knoll. There are so many conspiracy theories that we know that we know they can’t all be true. We may never know what actually happened on November 22, 1963 other than President John F. Kennedy was assassinated. However, we can formulate in our minds, from what we read, that we think happened. This article has too much information to read at one time, so might be a good page to bookmark for future reference, especially to the links at the end of the article.